Bridal Bee's Blog on Flower Girls & Beyond: Princess Angie Janelle's First Birthday! We love all the photos that our happy customers send in to us or share with us on Facebook. It makes us smile from ear to ear when we get to hear back from cheerful and proud parents as they share with us photos of their little ones wearing their NancyAugust.com outfits at a special event! Shipping out dresses and suits every day gets to be a little mechanical but something so simple as one photograph makes us realize how awesome our jobs here at NancyAugust.com. 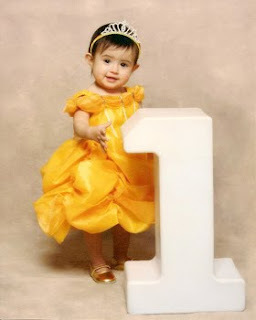 Speaking of photographs, check out this ADORABLE photo of Princess Angie Janelle in one of our dresses for her first birthday! Isn't she so precious?! Special thanks to her mommy, Yanelli Piedra, for sharing this photo with us. Princess Angie looks so cute standing next to that big number one; it's almost as big as she is! She seems to enjoy how fantastic and adorable she looks in her bright and fancy princess dress! We hope this princess got the sweetest first birthday party that she deserves! Angie is wearing our Baby Belle Princess Dress, Item Id: LK-BELLE-DRESS. This is the fanciest of the fanciest when it comes to princess dresses! A bold and beautiful golden yellow color is paired with the voluminous skirt around town! The full ballroom gown style silhouette is matched by a corset-inspired bodice complete with off-the-shoulder style sleeves and corset ribbon ties in the back! A matching headband is included, but you could always switch that out with one of our sparkling, exquisite princess tiaras! Be sure to check out our accessories section for headbands, tiaras, wands, gloves, and plenty of other princess-perfect items! 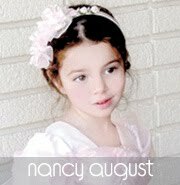 If you would like to be featured on our blog, send a photo of your little one wearing his or her NancyAugust.com purchase to Info@NancyAugust.com! Are you looking for a princess dress? Click here!